The van market can be pretty baffling at times, as it is so crowded with big names and numbers. There are many factors to consider when purchasing, like loading space, wheelbases, height, length and so much more. Working out which would be the best for you is vital to your business, so we have put together a list of vans that you should consider buying in 2016/2017. 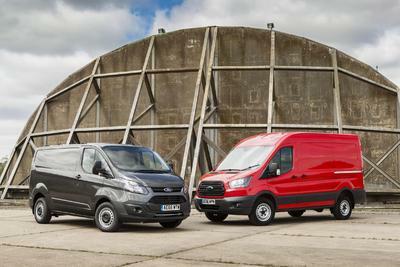 We’re sure you aren’t surprised to see that this van made it into our list, as has infamously been described by Ford as ‘the backbone of Britain.’ The company passed the 7 million sales mark in 2015, and that is because the Transit has so much to offer. There are around 450 different ways to spec-up a Transit van, so there will be at least one variation that appeals to buyers. With a choice of short and long wheelbases, body lengths, roof heights and more, this van can be made to suit your needs. Even with the larger models, you will feel nimble on the roads, thanks to the direct steering and well-judged suspension. It’s no wonder that we see so many of these vans on the roads today. The Crafter brings VW Group technology to the panel van sector, offering a high-quality commercial vehicle to customers. They are powerful machines, due to the 2.0-litre TDI diesel engines with 100bhp, 138bp or 174bhp. There are also front, rear and four-wheel drive versions with a choice of 6-speed manual or 8-speed automatic gearboxes. It can offer cargo volumes of up to 18.4m3 and loading heights up to 2,196mm. The spec list for the Crafter is very extensive, so if you’d like to see a full list, take a look at Leasewell. With so much to offer, we think that this vehicle will continue to sell well in 2017. Mercedes-Benz is a big name in the van market, with a number of commercial vehicles available to buy. However, it’s the Sprinter that steals the show, with an impressive nine different body styles on three wheelbases, four different body lengths and three roof heights. Its 2.2-litre four cylinder delivers 95bhp, 129bhp or 163bhp, while the 3.0-litre V6 offers 190bhp, so you aren’t short on power with this van. With the Sprinter, you are given the choice to tailor it to your needs without compromising any of the technology, and that’s why it’s made our list. Although this van has two sister models, the Renault Master and the Nissan NV400, it is definitely the Movano that takes centre stage. It offers load volumes from 7.8m3 all the way up to 17m3, so you will have plenty of space for your products. There is also a particularly good range of passenger carrying options, including a 9-seat version and a full-on 17-seat minibus. With four body lengths and three different heights, it is very simple to get a Movano that fits your needs perfectly.